Bitdefender Rescue CD is just what it sounds like: a free bootable antivirus program you can use to fix your computer if it has been corrupted from a virus infestation. You can update the program and scan any file or folder you want, without having to check entire partitions for viruses. This review is of Bitdefender Rescue CD v2, last updated on December 12, 2018. Please let us know if there's a newer version we need to review. From the download page, choose the link called bitdefender-rescue-cd.iso to download the latest version of Bitdefender Rescue CD as an ISO image. Next, you must burn the ISO image to a disc and then boot to it from your computer to use the program. If you need help creating the bootable disc, see How to Burn an ISO Image File to a DVD, CD, or BD. Also, see How to Boot From a CD/DVD/BD Disc if you've never booted from a disc before. If you'd rather not install the desktop version of Bitdefender to your computer, the Rescue CD is a great option to still get some of the benefits of the virus scanner but without having to boot into the operating system. From the settings, you can choose to Enable the file drop zone to place an always-open box on your screen so you can drag and drop single files or whole folders into it to be scanned by Bitdefender. This is in vast contrast to most other bootable antivirus programs, which usually allow only whole hard drives to be scanned and not specific files. Some other useful options include excluding certain file types from scans, enabling archive files to be scanned, and scanning files that are smaller than a particular size. In addition to a virus scanner, a shortcut on the desktop of Bitdefender Rescue CD makes it easy to download and install the free remote access program TeamViewer. 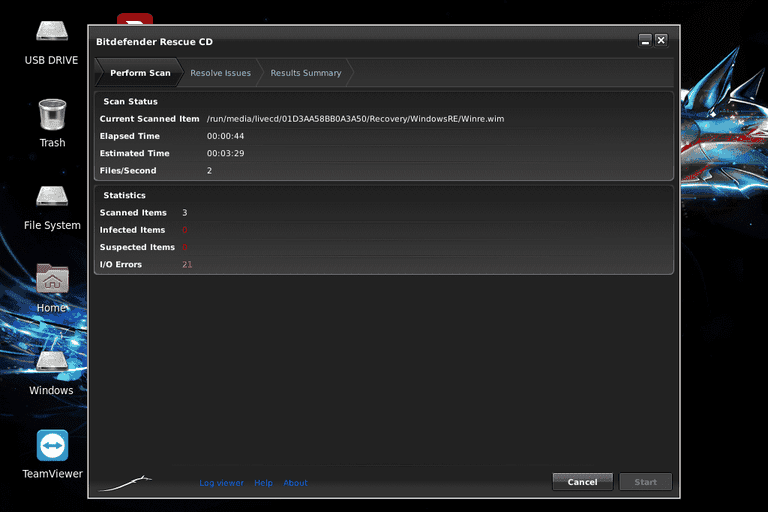 There isn't much we dislike about Bitdefender Rescue CD except that it might take some time to download the software.